“Great Lakes” is an album haunted by water: water that drowns (“Oceans of Doubt”) and destroys (“Brand New Oblivion”), protects (“Bigger Than The Moon”) and purifies (“Great Lakes”). It’s an album about the forces that move us: storms, currents and tides. And it’s an album about the long road to finding one’s way (“A Kiss To Build A Dream On”), and finding one’s way home (“Something In-Between”). And the whole thing began with a promise. I was sitting on the edge of the Mississippi River in Memphis in dog days of summer 2014. I had taken this brief walkabout to contemplate a potential new job at Facebook after 18 long years at MTV where the relentless new cycle, and culture of long days and weekends had taken their toll. As had the sleepless years of early parenthood. I was under-slept, out of shape, and out of sync with myself. My guitar languished in its case deep in the back of the closet, and my notebook was bereft of new songs. Three weeks later – armed with just a few potential song titles and idea fragments — I boarded a flight to begin recording. I wrote “Something In-Between” a few hours after landing in Des Moines, and never looked back. I tracked most of “Great Lakes” ten songs at Jon Locker’s Sonic Factory Studios over two long, productive weekends in 2014-15. Jon (who recorded “Heartland” and produced “Forever Young”) engineered with an assist from Slipknot producer Matt Sepanic (who, despite his CV, is responsible for coaxing some very pretty vocal performances ut of me). I also logged a dozen or more sessions with Jeff Berner at Studio G in Brooklyn. By the time tracking was complete, I’d enlisted a small village of willing co-conspirators: my talented, singer-songwriter cousin, Andy Wagner played guitar, piano and keyboards, helped me finish lyrics, and imagine a broader, bigger soundscapes than ever before (especially on “Great Lakes” and “Ocean of Doubt”); Jon and Nadas’ drummer Brandon Stone rounded out the rhythm section; longtime bandmate (and dear friend) Chris Abad lent guitars (as did Berner); Des Moines Symphony cellist Patrick Riley arranged strings; and stalwart collaborators and friends Casey Shea , Jamie Leonhard and Mai Bloomfeld provided additional vocals. Jon and I spent the spring of 2016 mixing via email: I would send him notes, he would send me mixes. His patience with my often-insistent attention to detail (i.e. : “5% less tambourine panned 10% right”) was steady and unflappable. Alex DeTurk mastered. 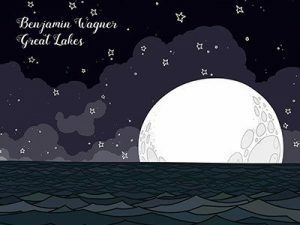 Though I don’t recall the instant it occurred to me, I was clear and confident about the album’s title well prior to its approaching release (roughly pegged for the Summer Solstice): I grew up by the actual Great Lakes, sure. And – between brutal lake affect snow and the wreck of the Edmund Fitzgerald, they seemed to possessed a terrific a terrible power. And, yes, I used to play a venue in Park Slope by the same name. But for me, the title is more about what it evokes: immense scope; great, unknown wilds; and the deep, dark, turbulent mysteries below the surface of everything. When it came to album art, though, I was stumped. I tried some actual photos of the Great Lakes themselves, but those were far too literal. I tried some slightly more abstract stuff (Flappers wading into Lake Michigan, kids on tire swings), but nothing worked. And then I remembered an artwork I’d commissioned at MTV. Whenever worked turned chaotic, my colleagues and I used to invoke the mental picture of a beautiful sun setting on a calm blue sea. And so, in my last, often-chaotic year there, I commissioned Sam Brown (of Exploding Dog fame) to illustrate a huge, 4’ x 2.25’ “Calm Blue Sea” that I framed and hung prominently in my office. When I left MTV shortly thereafter, though, I couldn’t bring myself to hang it at home; it too reminiscent of too much chaos. And so – like my acoustic guitar – it languished in my closet. Until it occurred to me that I could transform that furious, waning masculine sun into a cool, beautiful, steadily-rising feminine moon. “Calm Blue Sea II” was born.